The near-disappearance of sampling as a primary force in popular music is a weird occurance. The legal and monetary complications are well documented, and frequently cited as the reason for sampling’s waning influence. The Avalanches reportedly had to pay for so many samples on their zillion selling Since I Left You that the band made no money at all. There was a reason that De La Soul named their second, enforcedly sample-light album De La Soul Is Dead. Why is sampling still relatively underused in a time when people make virtually no money? 25% of nothing is nothing. Sampling is a powerful tool when used creatively – listen to Paul’s Boutique and prepare to shake your head in bewilderment – and one that perhaps will rear its head again soon. 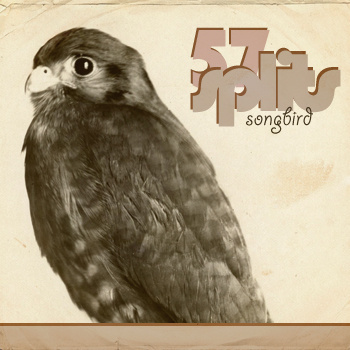 57 Splits have discovered the same dizzy excitement in sampling, just as Eric B, the Bomb Squad and DJ Shadow did before them, and has created songs which are stupendously satisfying in their direct, tactile nature. In grabbing a few snatches of sound, looping them and cutting them, songs as simplistic/complicated as Science emerge, a song that cutely marries cut ‘n’ paste drums with slightly esoteric guitar noodling. Yes, I know it sounds like that it shouldn’t work. But that’s one of the delights of sampling – grab this, push it together with that and see whether the resulting sound is a shabby mess or a fascinating triumph. Rinse, then repeat. 57 Splits‘ music tends to be the latter. He told me that his songs form concept albums. Again, this all sounds like a recipe for disaster. But in reality, 57 Splits makes music so viscerally satisfying that any doubts are clobbered by the forcefulness of the technique. Great. Posted on May 10, 2011 by Joe Sparrow. This entry was posted in Headline, Today's New Band. Bookmark the permalink.